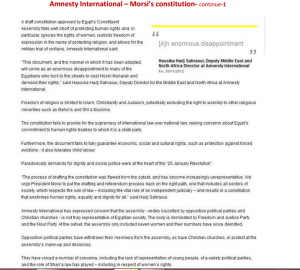 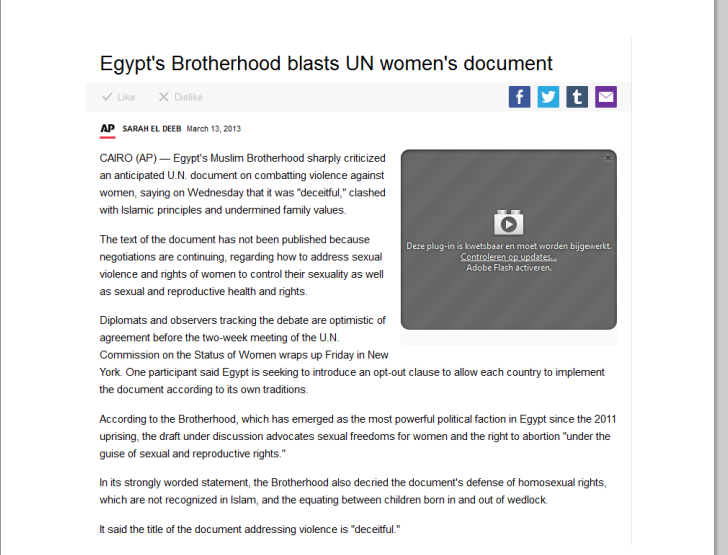 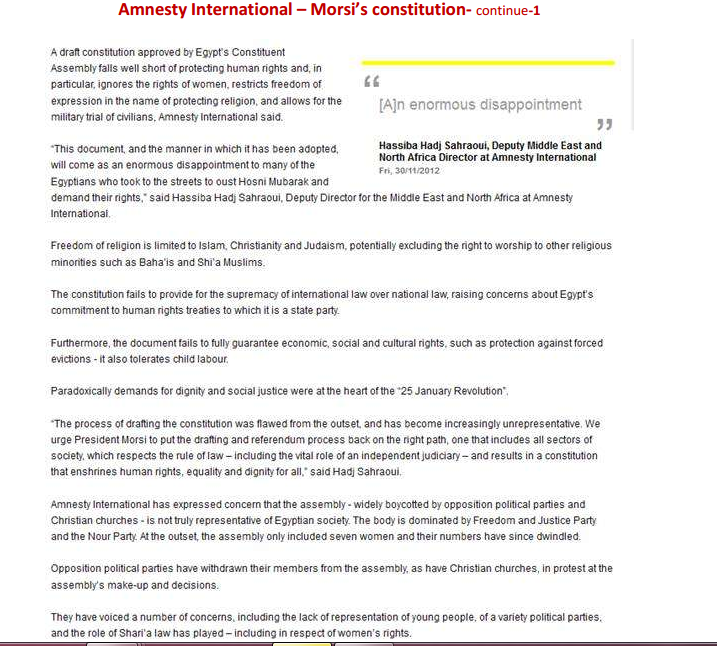 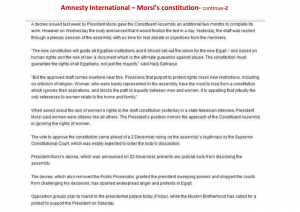 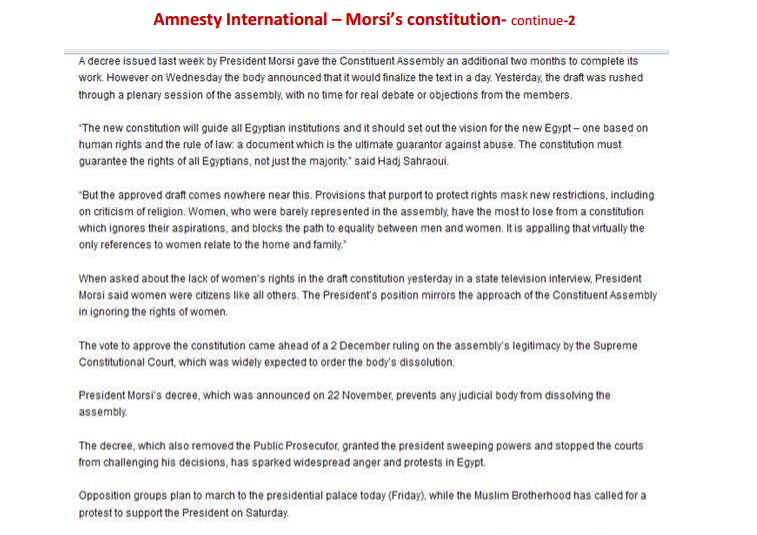 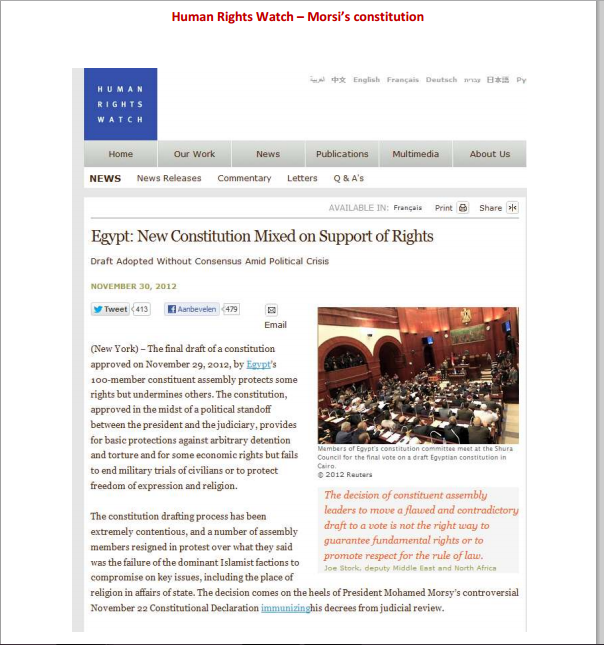 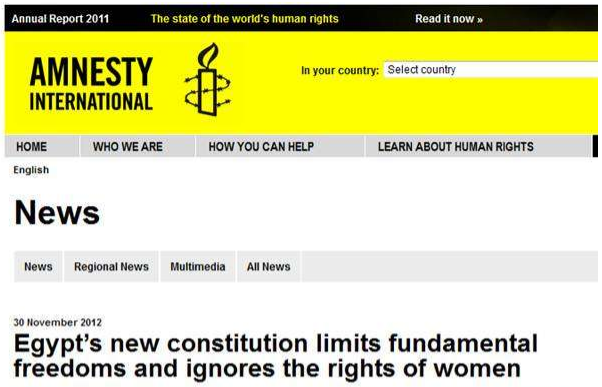 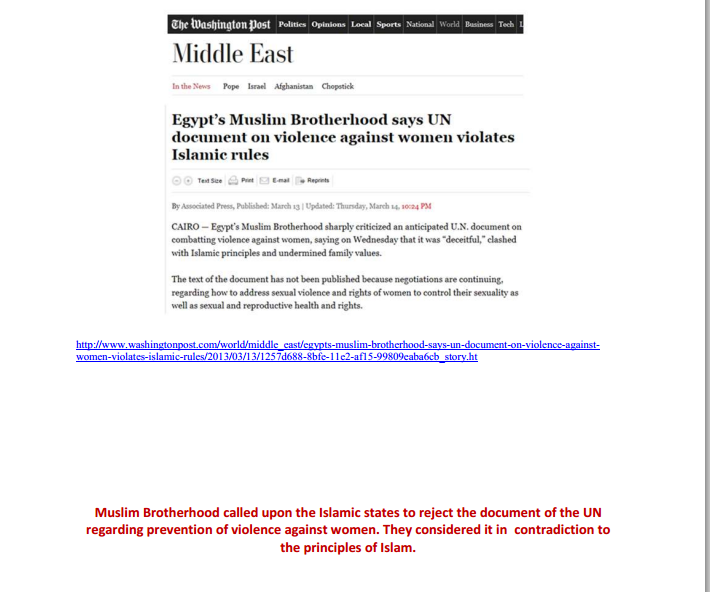 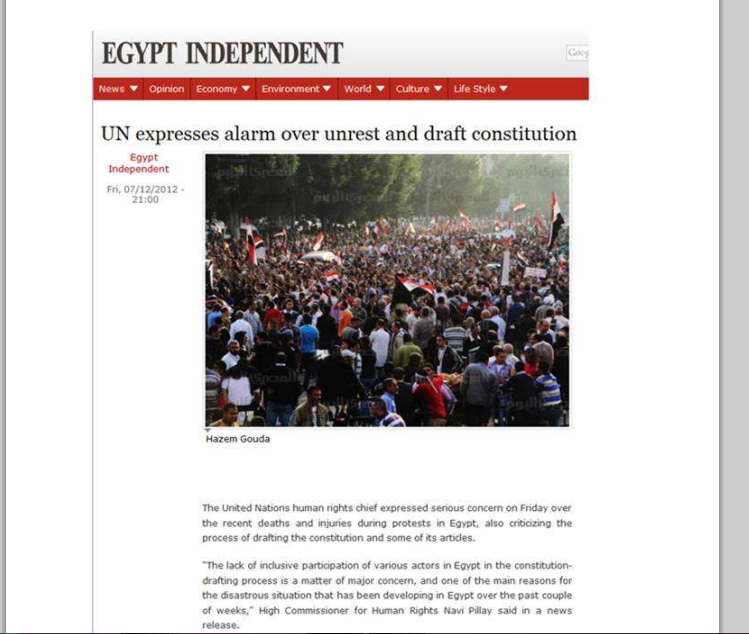 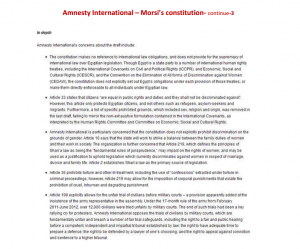 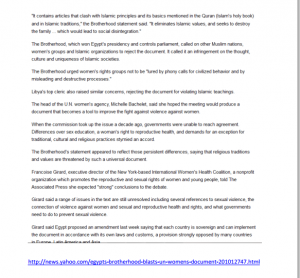 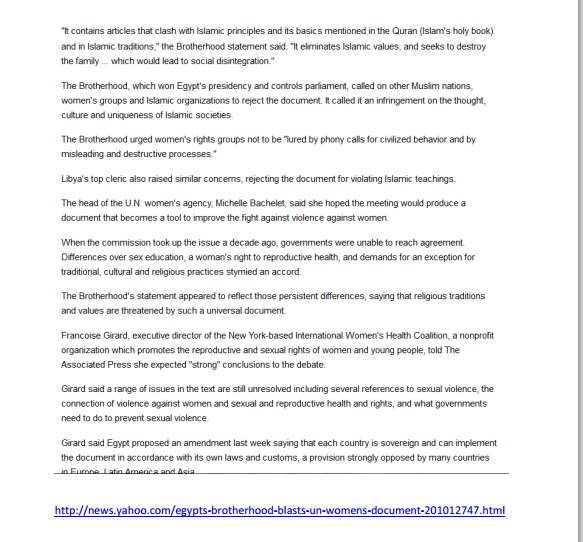 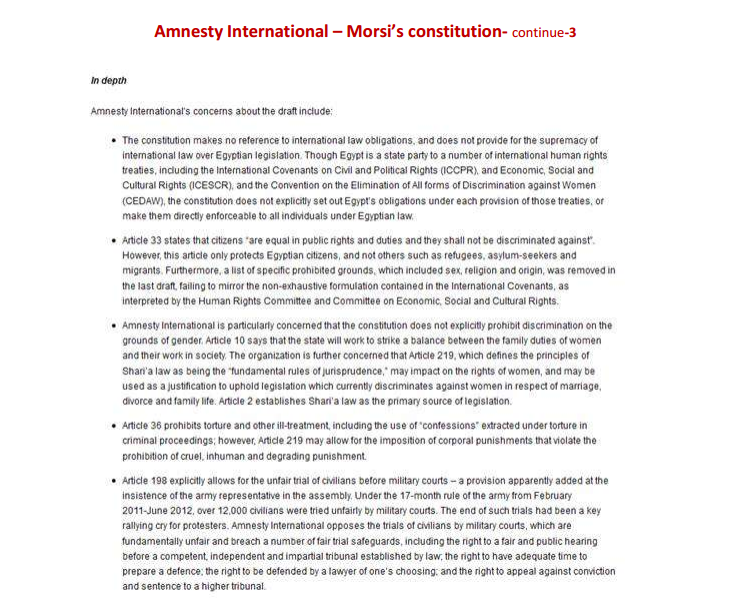 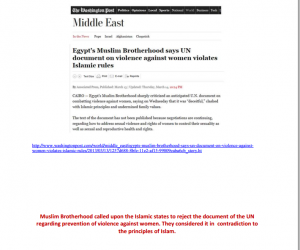 Amnesty International 3 parts report on Brotherhood Constitution: Egypt new constitution limits fundamental freedoms and ignores women rights. The famous salafist Yasser Borhami, member of the Constitutional Committee (assembly) , praised the new Islamic constitution. 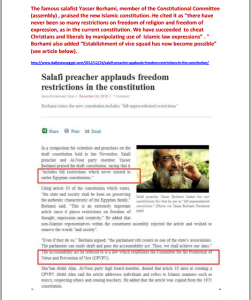 He cited it as “there have never been so many restrictions on freedom of religion and freedom of expression, as in the current constitution. 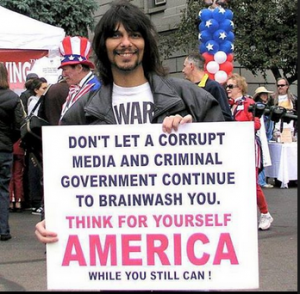 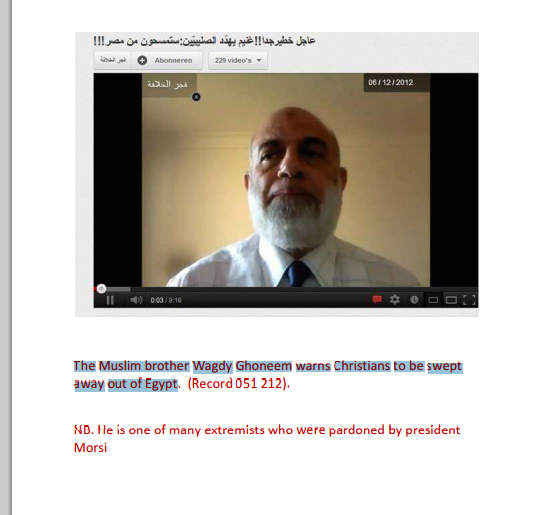 We have succeeded to cheat Christians and liberals by manipulating use of Islamic law expressions” . 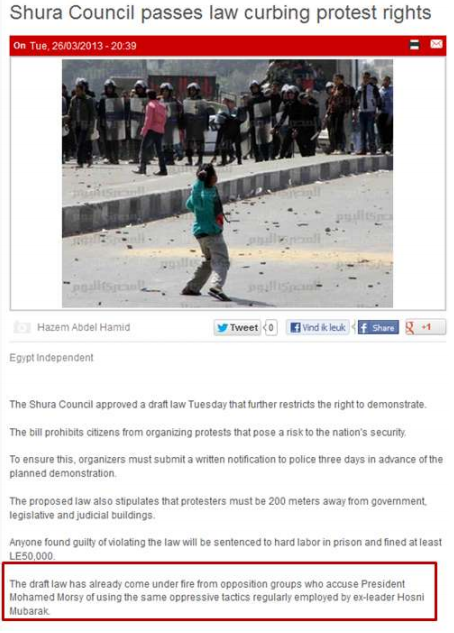 ” Borhami also added “Establishment of vice squad has now become possible” (see article Screenshot below). 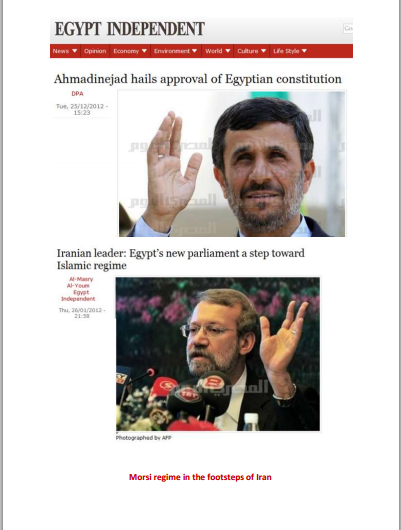 Iran supports Muslim Brotherhood regime, who was following Iran footsteps in Oppression against their own people, Join the Tyrannies Fascism religious Club! 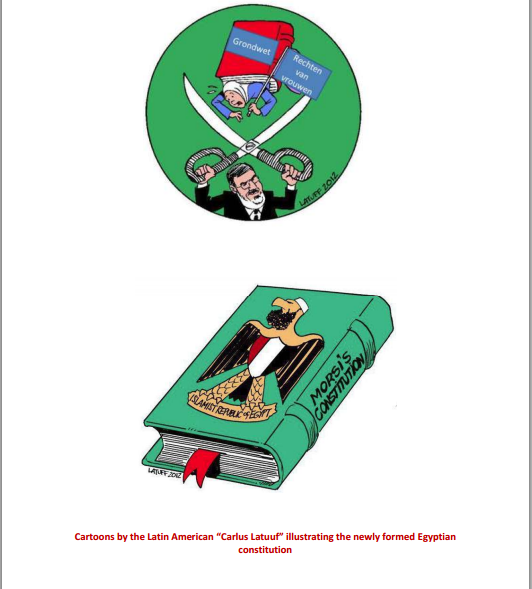 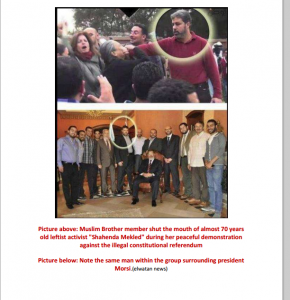 Muslim Brotherhood and their supporters committed torture, violence, terror and killing acts against Egyptian Political Activists and anyone who opposed the oppression and the Fascism Brotherhood regime and their Constitution. 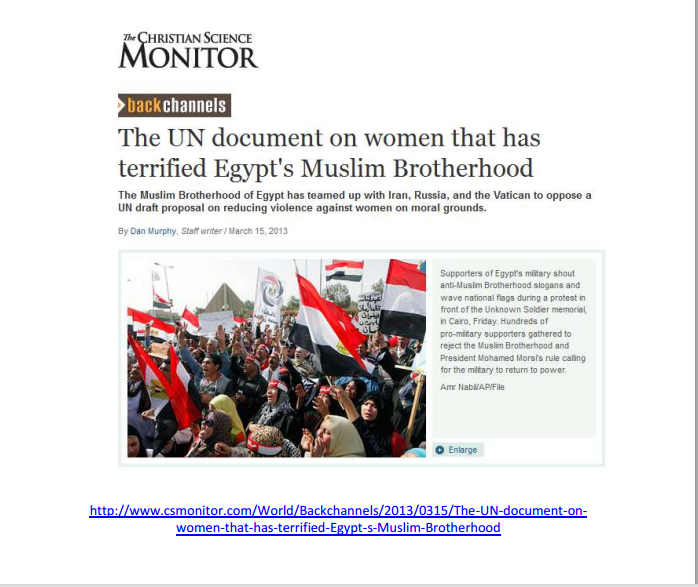 The World was deliberately blind towards Brotherhood violence and terror against the whole Egyptian Community, during the Brotherhood regime. 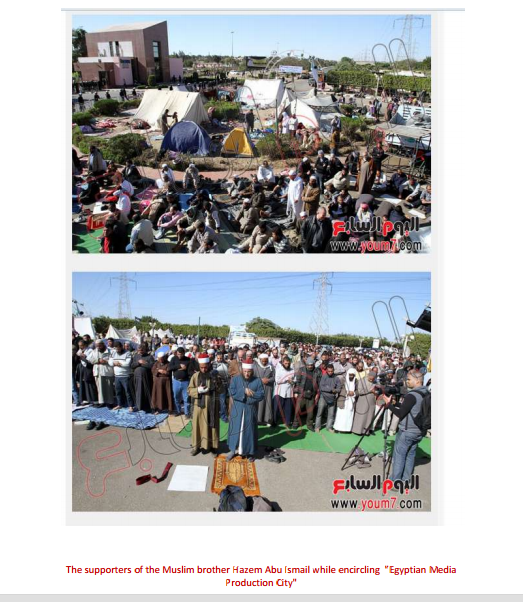 Protests in Suez and Mahala Cities against the crimes of Muslim Brotherhood against the peaceful demonstrators by Etihadeya presidential palace. 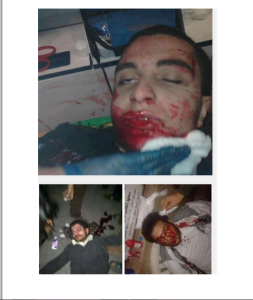 An Ex-Egyptian Diplomat got dragged by Brotherhood supporters in front of Etihadeya Presidential palace and was beaten brutally as he was protesting peacefully against Brotherhood practices – Also a political activist, got shot and tortured for the same reason. 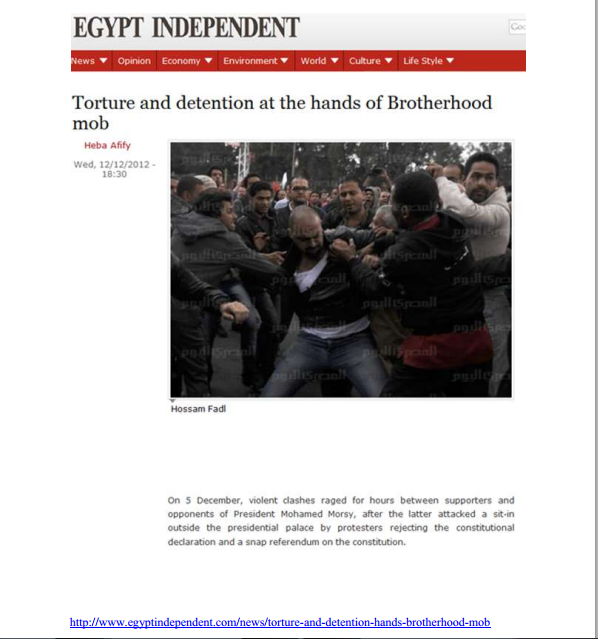 Brotherhood tortured demonstrators who were against Morsi dictatorship and forced them to confess that they belong to Mobarak Ex regime or to confess that they got paid by whoever to demonstrate against the President. 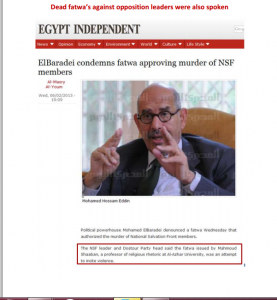 Alhusseiny Abu Deif Egyptian journalist was shot dead by Brotherhood supporters because he was demonstrating against Brotherhood regime – Etihadeya Presidential palace demonstrations. 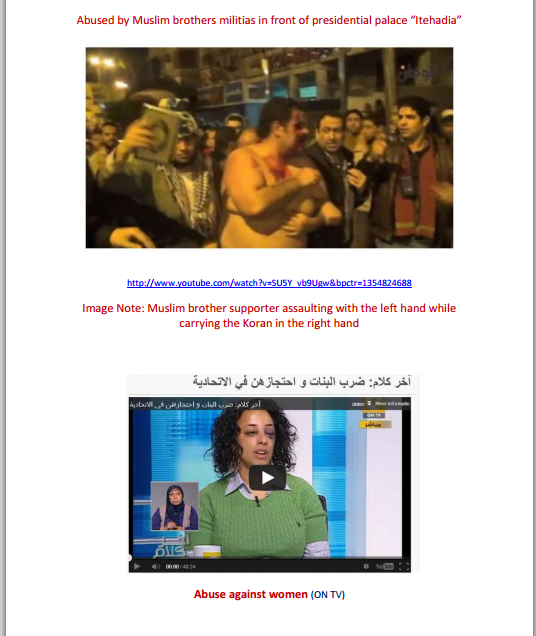 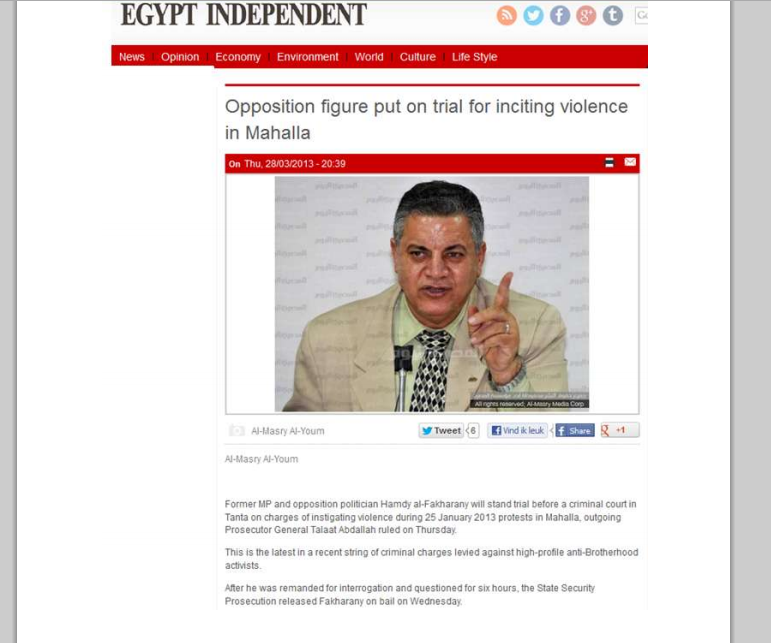 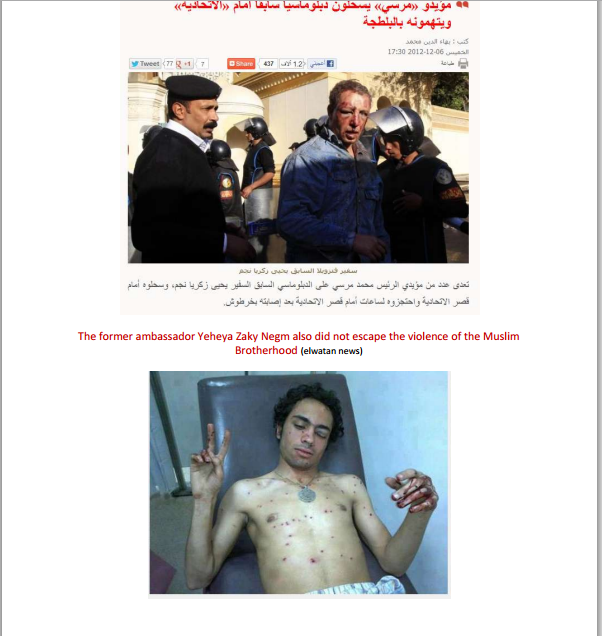 Brotherhood militias attacked women: Shahenda Meklid Political activist – 70 years old – see the guy who attacked her in the following image, he is the same guy in the image with brotherhood leaders and Mohammed Morsi the Ex President of Egypt – One of his Brotherhood special Guards!!! 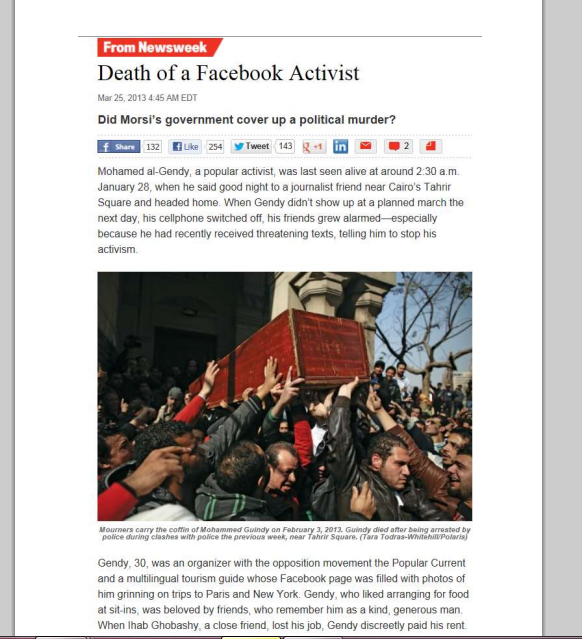 Facebook Activist and a member in one of the opposition party, found brutally tortured and died from severe injuries, just 3 days after he was found and moved to the hospital in a very critical conditions. 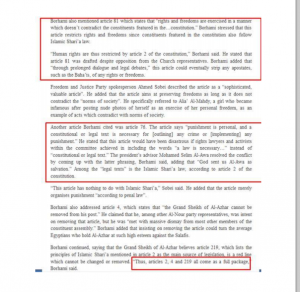 The Doctor who made the autopsy resigned and confirmed that he got threatened by Muslim Brotherhood to right an autopsy report to state that the facebook activist died from a car accident. 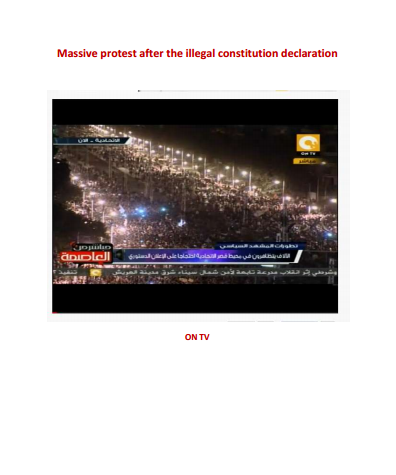 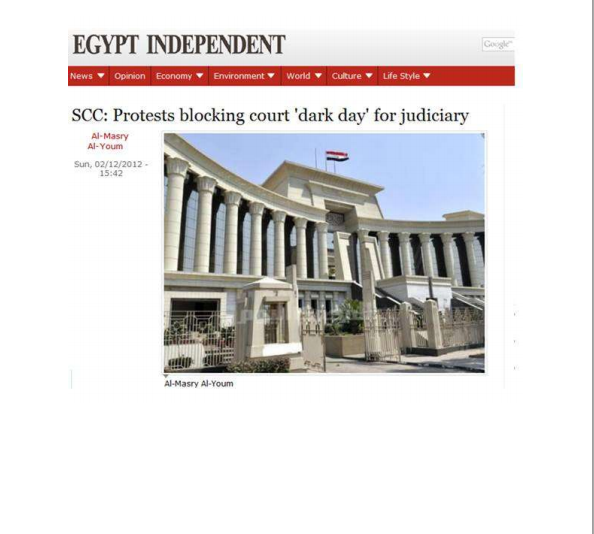 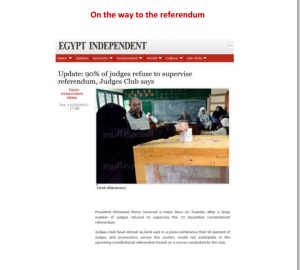 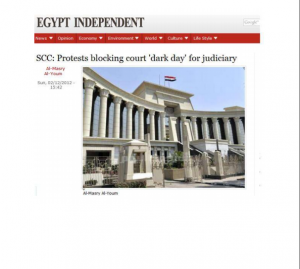 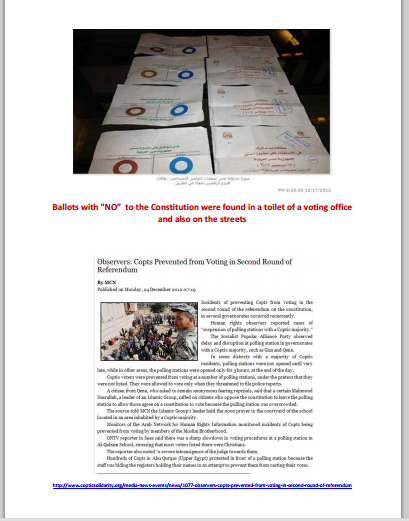 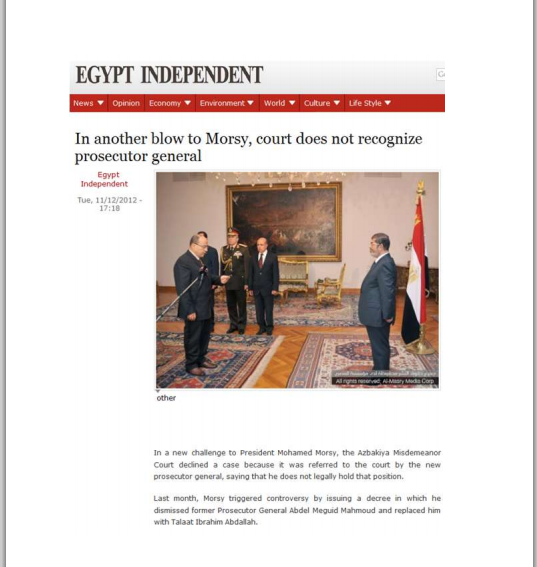 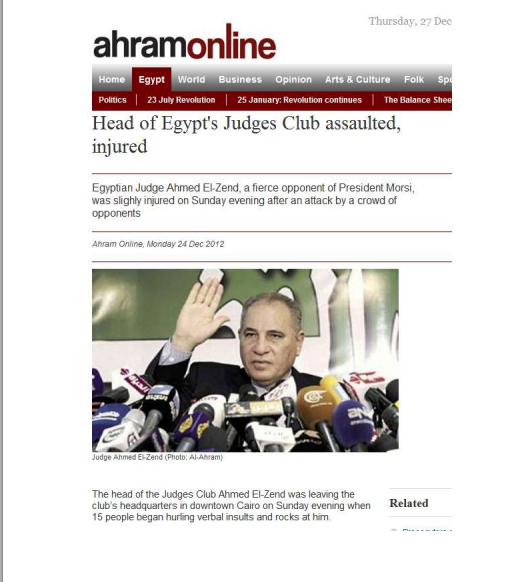 That file of course was closed during the Prosecutor General appointed by the Mohammed Morsi the Ex President!!! 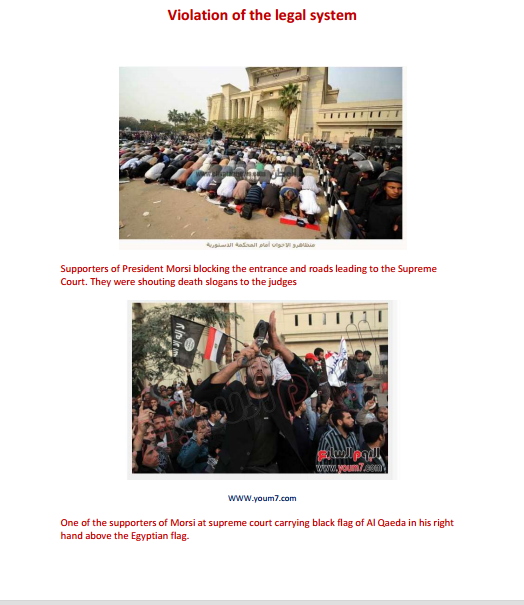 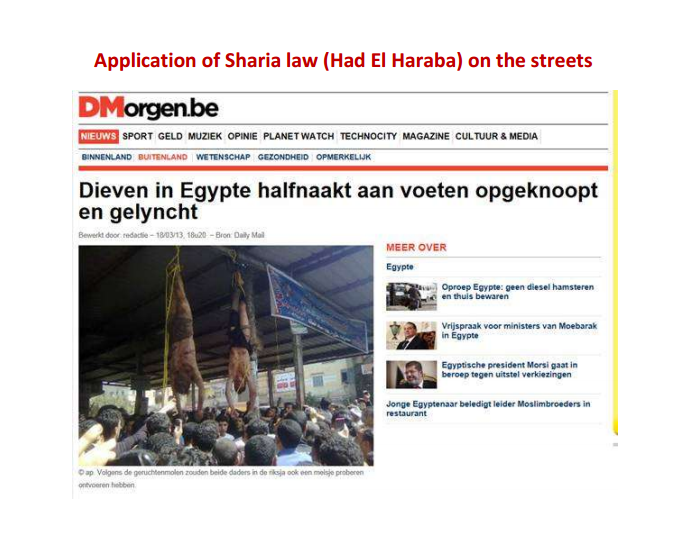 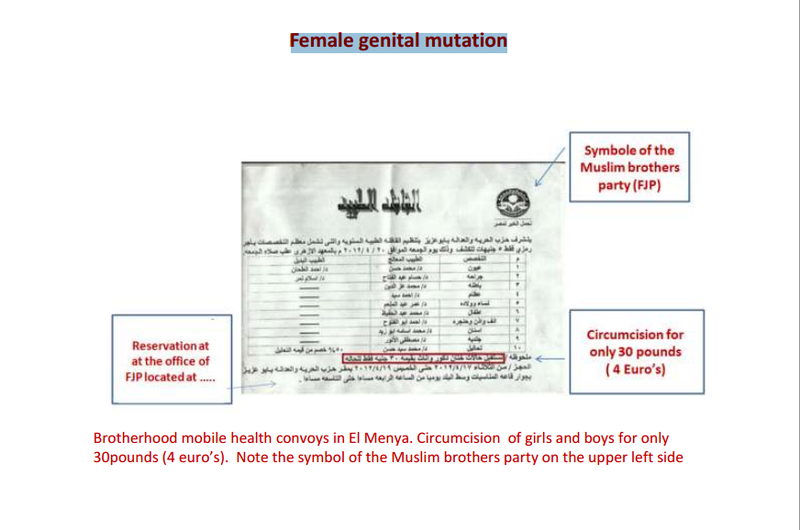 What you see in the following image, is the dark ages culture Muslim Brotherhood and their followers have spread in Egypt, which was a brain wash to ignorant people who gave themselves the right to apply Jungle law, based on Mohamed Morsi the ex President declaration and decision of allowing Egyptian Citizens to have the Judicial Officers Power of law against any citizen that they suspect. 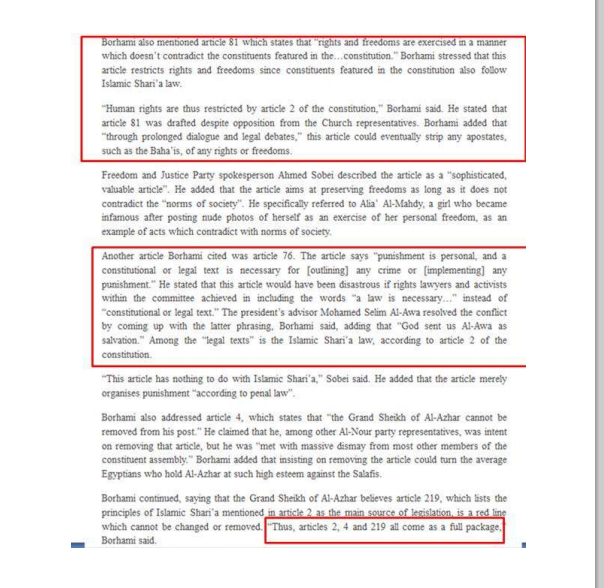 That was officially applied during Brotherhood rule, in order to give their own supporters and Militias, the right applied by the power of law to arrest, suspect, torture and kill any citizen they target, and of course they targeted anyone who criticized or demonstrated against the President of the Muslim Brotherhood rule!!! 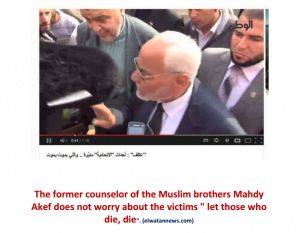 The former counselor of the Muslim Brotherhood Mahdy Akef does not worry about the victims who got killed or tortured to death by Brotherhood supporters – he said:” let those who die die, as long as they do not belong to the Muslim Brotherhood Sisters or Brothers!!! 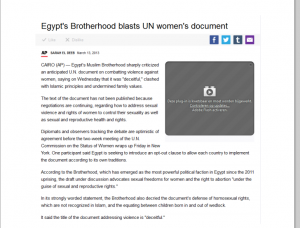 Sexual aggression by Muslim Brotherhood Officials – Minister of Media – The Muslim brother minister of information used repeatedly verbal sexual aggression against female journalists by saying” are your questions are so Hot as you are?!!!. In another occasion he answered a question of an Egyptian journalist “ come to me and I will show it to you”!!!. 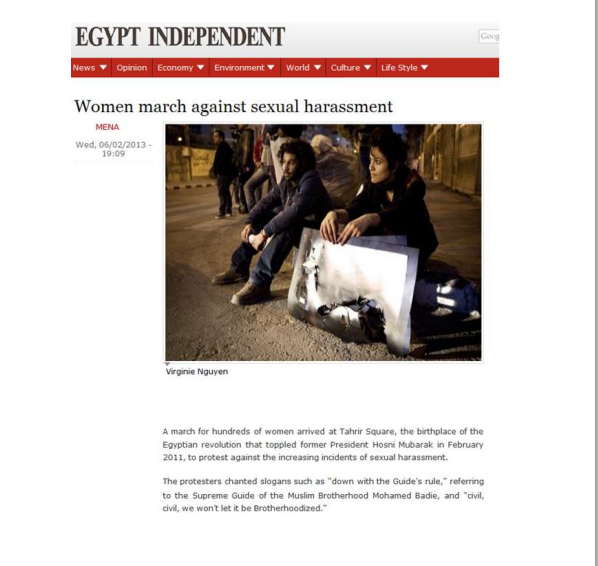 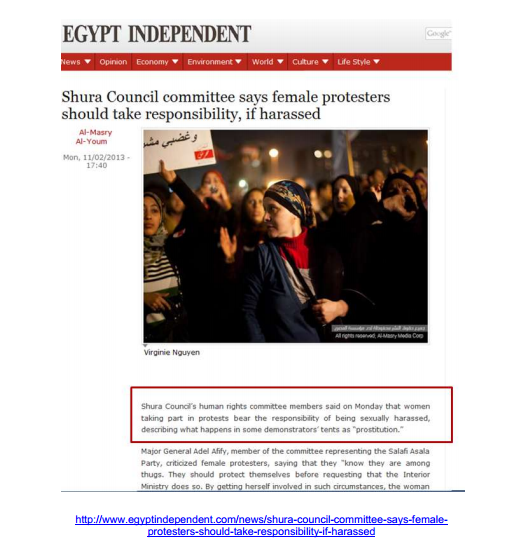 Shura council described women demonstrations against Brotherhood rule is a prostitution!!! Violation of the legal system Brotherhood supporters blocked the entrance and roads leading to the supreme court and they were shouting death slogans to the judges and that they are waiting for a signal from President Morsi and they will right away bring all judges of supreme courts cut into pieces in bags – One of Brotherhood supporters carrying AL-Qaeda Ossama Bin Laden Flag in front of the supreme Court. 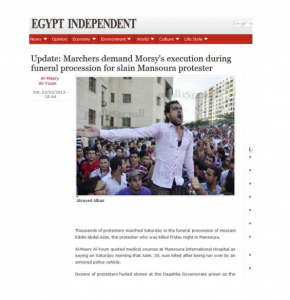 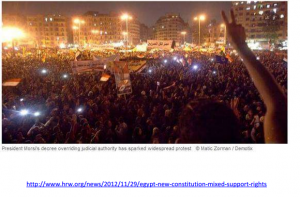 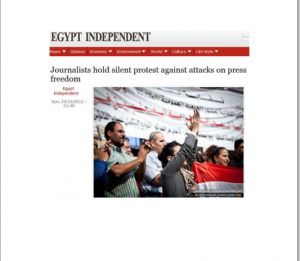 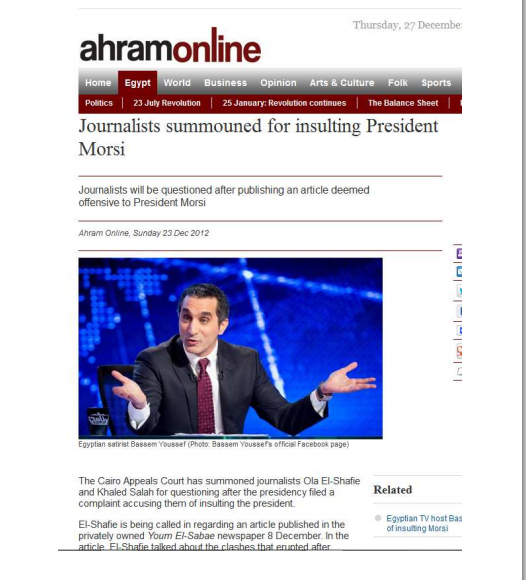 Sixteen journalists were judicially prosecuted and even accused of blasphemy after only five months of Morsi presidency. The Arab Information Network for Human Rights stated (19/01/13) that the number of lawsuits against journalists accused of insulting the President, in the fifth month presidency of Mohamed Morsi were four times more than during 30 years era of the deposed President Hosni Mubarak. 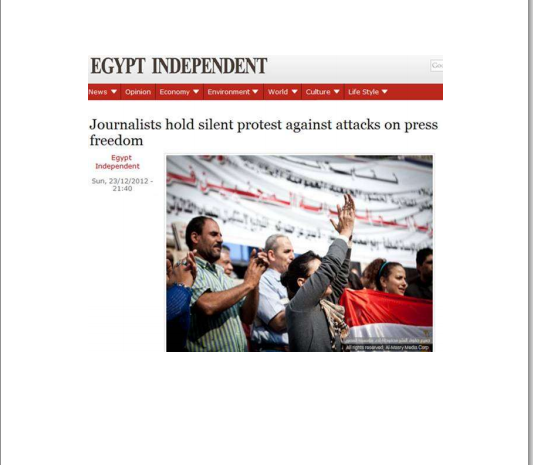 The supreme commission of journalists who for years has fought for freedom of expression and included stars of Egyptian Journalism was dissolved and replaced by Muslim Brotherhood and by Salafists that have nothing to do with journalism. 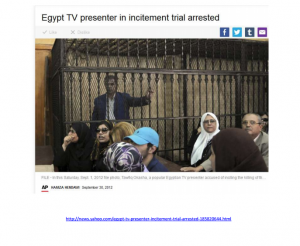 Death threats to several journalists and TV presenters including Youssef El hosseny On Tv Channel, Bassem Youssef CBC Channel, Tawfik Okasha Al-Faraeen Channel, Amr Adib Al-Qahera Al-youm Channel…etc. 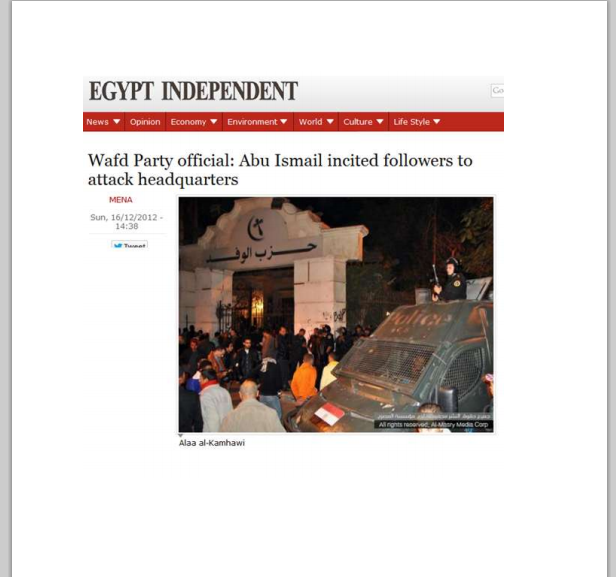 Even the well-known journalist Ibrahim Eissa (one of the strongest critics of Mubarak during his period in power) was threatened with death by The supporters of the Muslim Brother Hazem Abu Ismail, former president candidate, surrounded the building of the Egyptian Media City where most of the free channels are located during many weeks. The Muslim brothers threatened their TV presenters and media personnel with death. 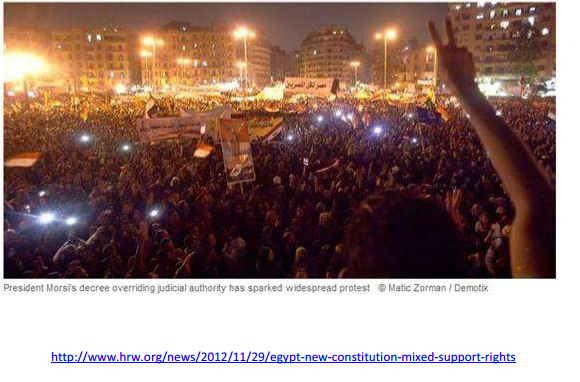 Morsi appointed Muslim brothers as chairmen for the National press, public broadcaster and as an information minister. 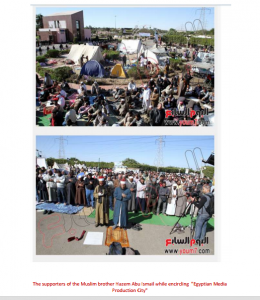 The journalists of El Ahram Newspaper came on protest against the policy of the Muslim brother chairman. 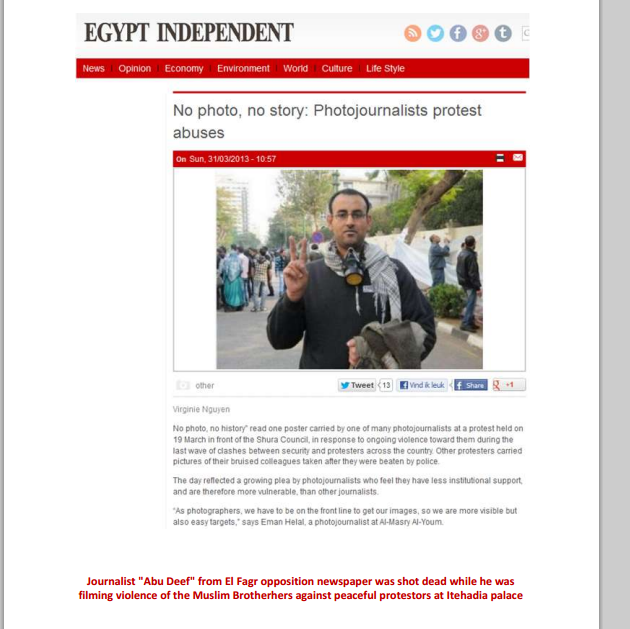 The journalist “Abu Deef” from the opposition newspaper El Fagr was shot dead while he filming the violence of the Muslim Brother supporters against peaceful demonstrators. 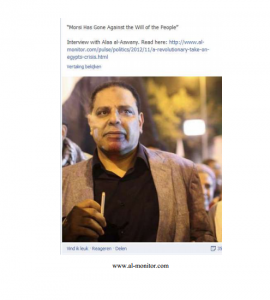 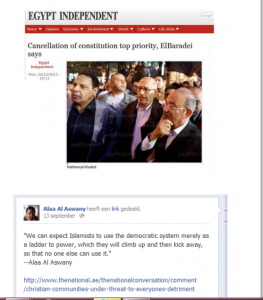 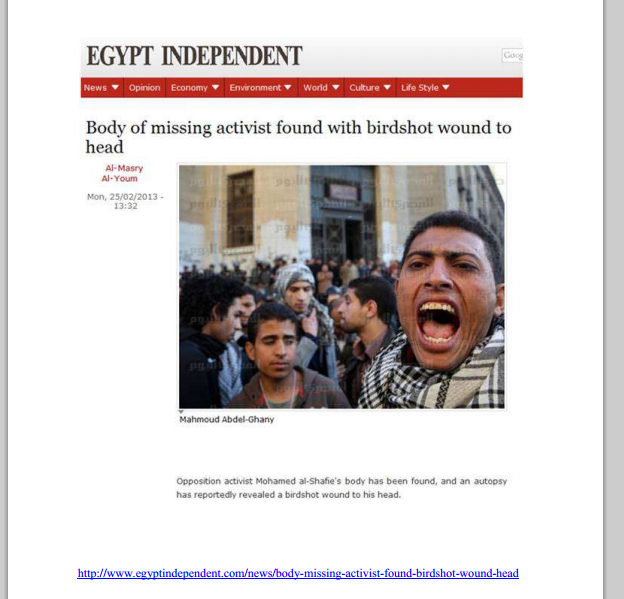 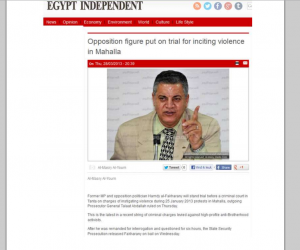 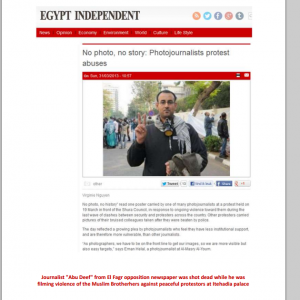 He was also criticizing the Brotherhood and Morsi’s regime through Social Media. 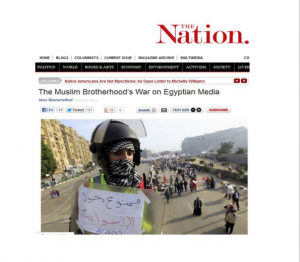 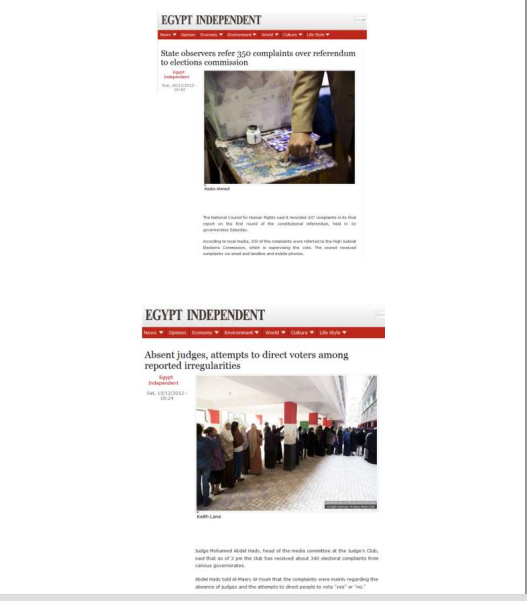 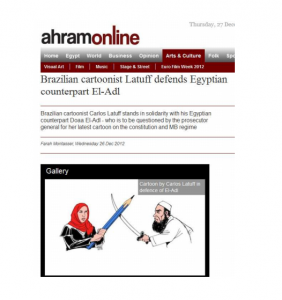 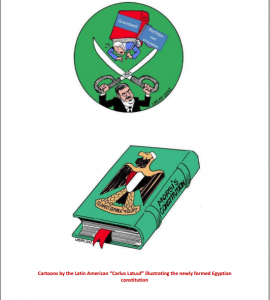 The Muslim Brotherhood War on Egyptian Media – all those events, not even for once, received any condemning by the President Morsi or the Brotherhood or even by the foreign Media. 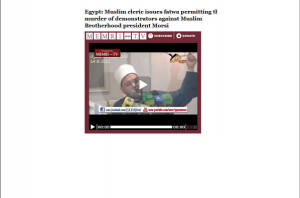 On the contrary, all this terror acts and oppression were sponsored by Morsi the President, Brotherhood, USA and the foreign Media were totally and deliberately Blind on purpose!!!. Al-Faraeen Channel’s presenter and owner in incitement trial arrested – accused of insulting the president and planning a coup against him – First time in history we see and hear a tv presenter who was accused of planning a coup against the president Live and on air!!! 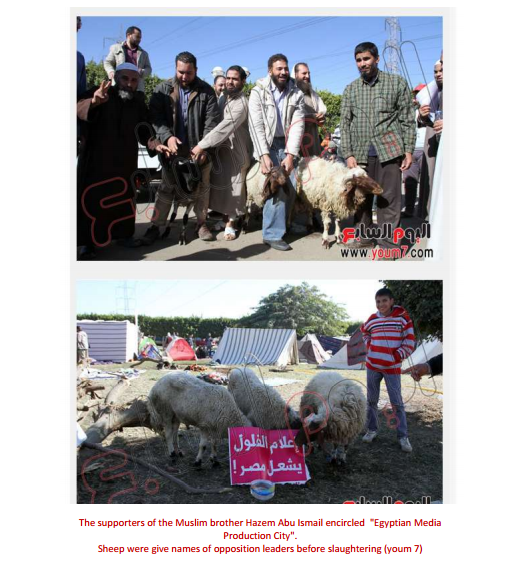 The supporters of the Muslim brotherhood, Hazem Abu Ismail and his followers encircled “Egyptian Media Production City” and Note the black flag of Al Qaeda Osama Bin Laden. 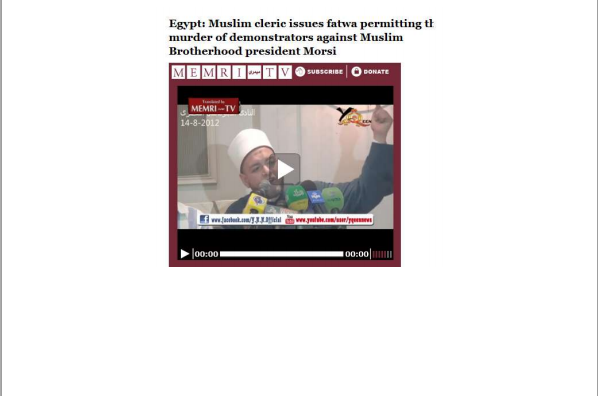 Threatened that if the Media is not going to stop criticizing the president and the brotherhood rule, they will burn all the medias people alive. 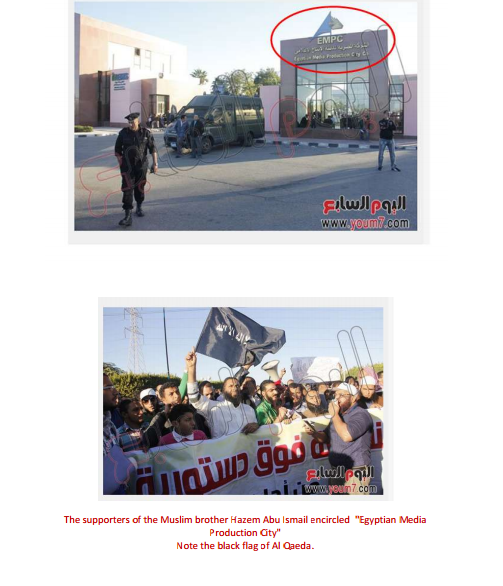 They were also blocking most of the entrances of the Media City, so no one can manage to go in or out.